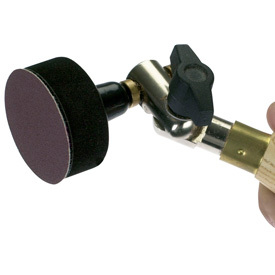 The Robert Sorby® Angle Sander features an articulated head that allows you to adjust the angle of the sanding pad to a wide range of positions. The hook-and-loop backing pad is made of high quality foam, that won„t break down and offers excellent flexibility to conform to the tightest curves. It will accept all hook-and-loop sanding discs. The sanding pad is driven by the work piece being sanded. Sanding near the outside edge of the disc causes it to rotate faster, sanding nearer to the center results in a slower speed. The sanding shank is fitted to the sander with a bronze bushing assembly that will last for years if lightly oiled from time to time. Comments On Oct 31, 2012:I thought this tool was likely another sanding gimmick but was pleasantly surprised at how well it works. Easy to use, virtually no marks from the sand paper. I should mention the sanding I'm referencing was the inside of some turned bowls.